How can a watch be futuristic and retro at the same time? It sounds like a riddle, but the Casio Telememo 30 World Time Ana-Digital watch provides an easy and inexpensive answer. How can a watch be futuristic and retro at the same time? It sounds like a riddle, but the Casio Telememo 30 World Time Ana-Digital watch provides an easy and inexpensive answer. This Casio has the square shape and stainless look of a classic watch from the 1960s or 1970s, but an aperture from 4 to 8 o'clock contains a fully functional digital watch. This Casio's face is reminiscent of something you'd see on a classic car dashboard instrument or hi-fi dial. The analog watch hands have luminous insets as do the hash marks from 9 o'clock to 3 o'clock. The slightly retro feel is enhanced by a cross hairs centered on the face of the watch. When you light up the watch at night, the watch is illuminated rather dramatically via a circle of lights that rings the dial. It may not be the most effective watch lighting ever, but the style of this watch is certainly a winner. The face of the watch measures 1 and 1/2 inches across and the case is a 1/2-inch thick. The stainless steel band was a little disappointing. It was a tad snug on my 8 1/2-inch wrists and had to be worn on my wrist joint itself. Every once in awhile, I inadvertently activate a button or two on watch when I bend my wrist back while doing routine activities. I even accidentally set an alarm and had to consult the manual in order to shut it off rather than just snooze it. Fortunately, the manual is fairly understandable and I was able to shut off the alarm. After losing a little weight, the watch also fit perfectly. While the watch has a retro look, it does have some very futuristic features. 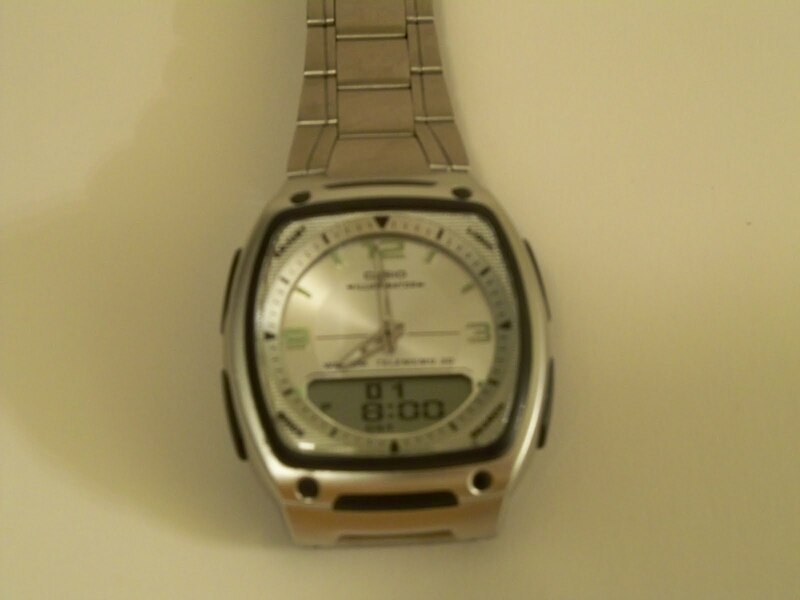 For example, the Casio Telememo 30 World Time watch has no crown! You set the analog hands by using buttons! It's amazing and fun to watch! Of course, it is another reason not to lose your watch manual. The Casio's Telememo features also allow the watch to remember 30 names and phone numbers. But, wait that's not all, this watch can also keep track of time in multiple time zones. Using the instruction manual, I found it very easy to enter a name and phone number into the databank. While most people probably keep their numbers in a cell phone address book, this watch can be a useful backup. The time zone functionality was also easy to use. Codes correspond to major cities like Los Angeles, Chicago, New York, London, Paris, Berlin, and Moscow. If you simply pick the major city in your time zone, indicate whether daylight savings time is in effect, and set the time, all the other time zones will adjust automatically. The timezone and Telememo features are very useful in a watch at this price point. It's nice to have a nice name-brand watch with an understandable manual. With low price watches like my Advance Watch Company Ana-Digital, it can sometimes be difficult or impossible to stop hourly beeping. I've been pleased with watches like my Casio Pathfinder. Overall, the Casio Telememo 30 World Time Ana-digital watch is a good value and, at a low price of about $25, it is an excellent deal for a watch with great styling and some interesting features.